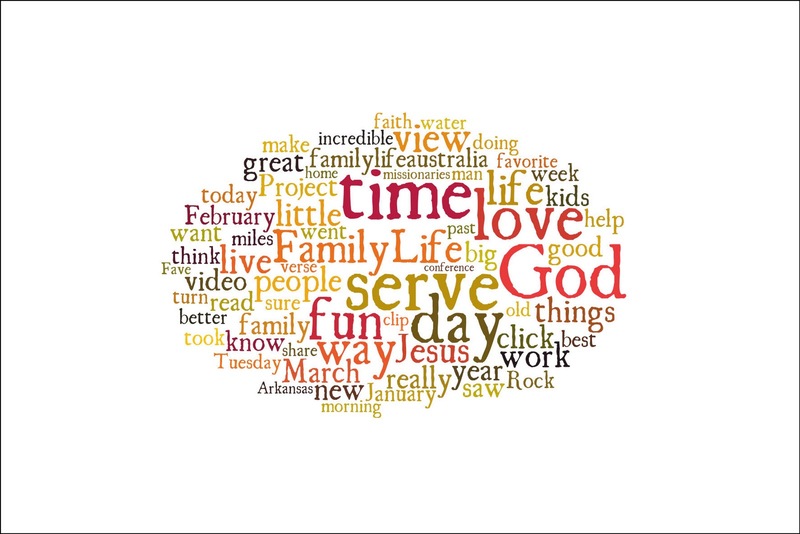 I put the text from all of our blog posts over the past year into a fun site called Tagxedo.com and this is what I got. I think it's a perfect way to sum up the past year of our lives! We serve a big, good, loving God... Sometimes life moves at such a hectic pace, and really, our lives are like a vapor, so we want to use what little time we have to love our kids, have fun as a family, enjoy the incredible view, and share Jesus. What words would you use to reflect the past year of your life? What words would you hope will sum up the next year? p.s. I also noticed the two words at the very top of the image: "faith.water" and instantly thought of Peter walking on the water. He's often criticized for "seeing the wind," getting afraid, and starting to sink... but of all the people in the boat, he's the only one who jumped out and walked towards Jesus, and as a result, the onlookers worshiped Jesus and said "Truly you are the Son of God." Maybe the same thing could happen in our lives. How about making it 11x14 and getting a print made as a great memorial of this year in your lives. Love it!